As I was photographing spring coralroot orchids in my front yard, I noticed a small green object clinging to the underside of one of the flowers. Zooming in with the camera lens revealed the object to be a caterpillar, but this was no ordinary caterpillar (i.e., a member of the order Lepidoptera), but rather a sawfly larva. Sawflies are not lepidopterans, but members of the order Hymenoptera, making them more related to bees and wasps while their larvae look much more like those of a moth or butterfly. Although there are few absolutes in the world of insects, distinguishing sawfly larvae from lepidopteran caterpillars is as easy as counting the prolegs (false legs behind the three pairs of true legs)—lepidopterans have at most 5 pairs of prolegs (often less), while sawfly larvae always have 6 or more pairs of prolegs. While its identity as some type of sawfly was immediately apparent, I wasn’t sure beyond that. One thing I was fairly certain about was that the orchid itself was likely not its host plant. I could see no evidence of feeding on any part of the plant on which it was resting (and orchids by the large seem relatively free of defoliating insect pests), nor could I find any other sawfly larvae on the plant or its neighbors (where there is one sawfly larva, there are usually more). Rather, I suspected that it had fallen from one of the many native oaks and hickories that shade the front yard (and which provide the habitat that allows orchids to grow in my front yard to begin with). Nevertheless, I Googled “orchid sawfly,” only to come up with page after page of links referring to the sawfly orchid (Ophrys tenthredinifera), native to the Mediterranean Region. That wasn’t much help, so I began the process of slogging through the sawfly images posted at BugGuide in hopes that something close had already been posted. Eventually I stumbled upon photos of larvae in the family Tenthredinidae, subfamily Blennocampinae that exhibited similar branched dorsal spines (including the pestiferous Monophadnoides rubi, or raspberry sawfly). I gradually settled on a generic ID of Periclista sp. based on the resemblance of the larva in my photos to those in photos such as this one, and the fact that this genus of ~20 North American species feeds as larvae on oak and hickory seems to support to the identification. 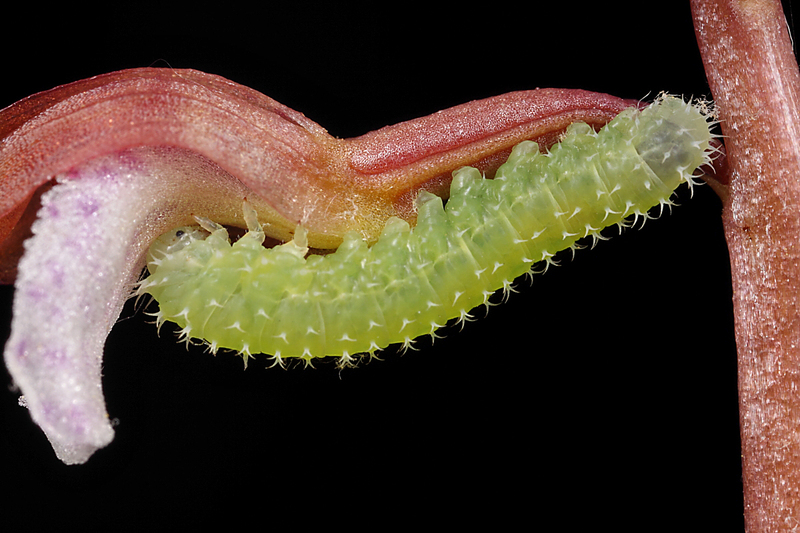 This past week’s Super Crop Challenge was taken from the dorsal side of the caterpillar in the first photo and rotated—it apparently proved a little too tough for most people to handle. Predictably, most participants guessed one of the different spined caterpillars of the order Lepidoptera, but Dave used the extended quiz time wisely and eventually came up with a correct ID and the challenge win. He even suggests the species P. marginicollis, based on its widespread eastern distribution and the bifurcate processes—it’s a good guess, but the larval description in Smith (1969) is a little beyond my comprehension, so I’m leaving the ID at Periclista sp. Dave’s win moves him into the top spot in the current overall standings, while Tim moves up to tie Alex for 2nd place with 9 pts each. This entry was posted in Hymenoptera, Tenthredinidae and tagged entomology, insects, Missouri, nature, quiz, sawflies, science, Super Crop Challenge. Bookmark the permalink. 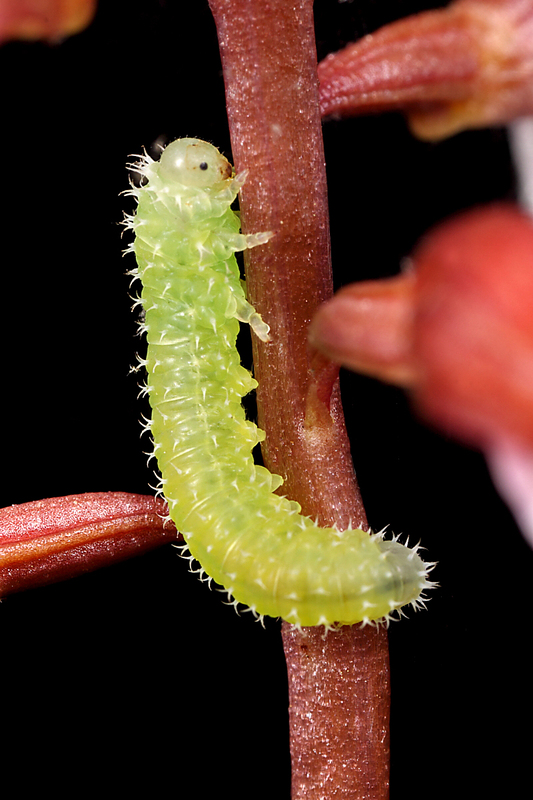 13 Responses to Sawfly larva – Periclista sp. Nice one! And good job on the caterpillar-but-not-Lepidoptera curve ball. I notice that, while BugGuide has an option to view either just caterpillars or just adults for Lepidoptera, it doesn’t have that option for sawflies. I wonder how hard that would be to add? Then again, I could just learn how to take full advantage of the advanced search. I figured I’d get a lot of lepidopteran guesses. I’ll bet that if you requested to one of the editors at BugGuide to give the choice for larvae and/or adults in Hymenoptera they would do it. I suppose one can also specify the stage in their search queries, although I didn’t try that myself. Hey Ted, good to know you weren’t blown away in a tornado. I owe my luck to an adult sawfly that I have keyed to three end points in the last week, all wrong. One of the great things about Dave Smith’s monographs is that his descriptions are lucid and detailed enough so that you have a fair idea if you are right or wrong. While perusing the plates in Smith (1969) the Periclista larva jumped out at me and I scurried off to BitB. A combination of business travel and family holiday left me with limited online access for the entire week after putting up the challenge post. I think it’s the first time in several years I’ve gone as long as a week without updating the blog – it was at once frustrating and liberating. I didn’t even think to look at the larval illustrations in Smith (1969), but I did note that there were several Periclista spp. with the larvae unknown. Personally I think P. marginicollis is a likely choice, especially since it is the only one known to feed on hickory (of which I have a lot). It was quite a coincidence that he and I posted sawfly photos on the very same day (much more so than when he and I have concurrently posted beetle/ant photos)! Excellent photos of all those prolegs! There are 3 pairs of “prolegs” in the photo. They are in front of the true legs. Therefore this caterpillar is a a butterfly or moth larvae. My mistake, was thinking “pro” came before ………. Sorry!